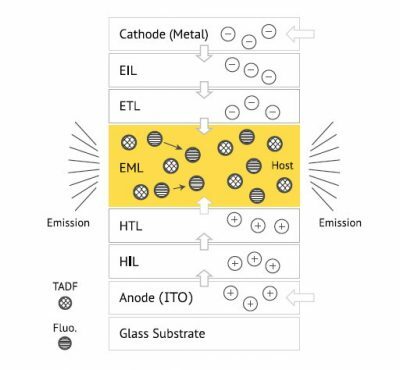 The heart of an OLED display is the emissive layer, where the electric charge is combined with the organic materials and light is emitted. The emissive layer is comprised of an emitter and a host, and is the subject of intensive research and development efforts. 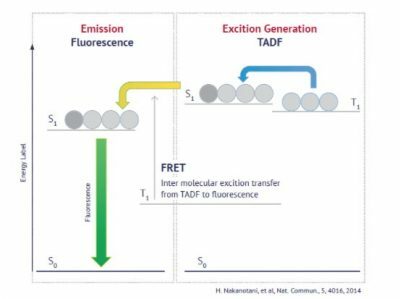 Hyperfluorescence is a combination of two emitter systems – TADF and first-gen fluorescence. TADF molecules have a small energy gap between the singlet and the triplet energy states (⊿Est). This enables up-conversion of excited energy from triplet to singlet spin, which provides highly efficient photonic emission from the singlet energy state in the form of delayed fluorescence. In Hyperfluorescence, the emissive layer is comprised of both TADF and fluorescence emitting materials. The TADF molecule generates excitons, and the excited energy transfers to a fluorescent molecule. The fluorescent molecule then emits four times more light than conventional fluorescence with the same input energy. 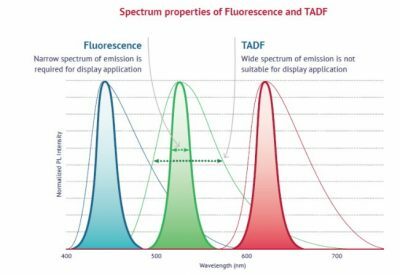 Hyperfluorescence provides the ultimate emission mechanism with high efficiency, low cost and high color purity – all without the use of precious metals.